Mark Shuttleworth, the founder of both Ubuntu and Canonical, noted in a blog posting today that "we will end our investment in Unity8, the phone and convergence shell," reverting back to the GNOME desktop in future versions of its Ubuntu desktop Linux. In 2011, after Motorola showed off its Atrix 4G phone with a dock that allowed it to connect to a display and pretend to function as a conventional PC, Canonical announced ambitious plans to eventually support phones, tablets, TVs and "smart screens everywhere" in a future version of its Ubuntu Linux distribution. Two years later it delivered its first developer edition of "Ubuntu Touch" for phones, aimed at replacing Android on select phones--particularly Google's Nexus models. Writing for CNET, Richard Trenholm wrote of Ubuntu Touch--after seeing it demonstrated at World Mobile Congress--that "on first impression I'm hugely taken with Ubuntu Touch. "It's elegant, thoughtful, and versatile, while remaining beautifully straightforward. Compared to the messy Android copycats Firefox OS and Tizen, it's by far the strongest potential rival to Android, iOS, and Windows Phone. In fact, I prefer it to iOS, which long ago lost its shine, and heck, maybe even to Android, too. Fingers crossed that manufacturers and phone carriers get behind it, because I'd happily lay down my own cash for an Ubuntu Touch phone." The next year Canonical showed off plans for Ubuntu TV at CES 2012, a project that never materialized. It appears that the company eventually hoped to have Ubuntu smartphones driving TV interfaces as an extension of its Atrix-like convergence concept. 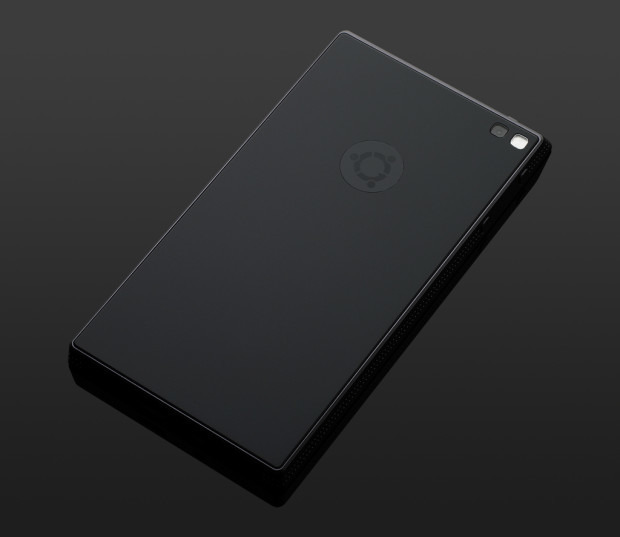 Toward the end of 2013, Ubuntu attempted to raise $32 million in funding on crowdsourcing site Indiegogo to build an Ubuntu Edge phone (below), selling tiers of reservations that cost between $600 and $800. The phone aimed to convert into a PC when connected to an external display (above). The project was canceled after reaching nearly $13 million in pledges. Canonical's Shuttleworth accused Apple of monopolizing the supply of sapphire screens that Ubuntu Edge expected to use. Two years later, Spanish Android maker BQ and China's Meizu shipped the first commercial phones running Ubuntu in place of Android, albeit without attracting much interest from buyers, despite the focus on convergence. Last year, a half decade after Canonical started work on smartphones, another enthusiastic reviewer, Jack Wallen of Tech Republic. wrote of the Meizu Pro 5 Ubuntu Edition, "many people have criticized Ubuntu Touch's laggy behavior. And while that is very much front and center on the Pro 5, I accepted that fact, simply because the platform is still in its youth." 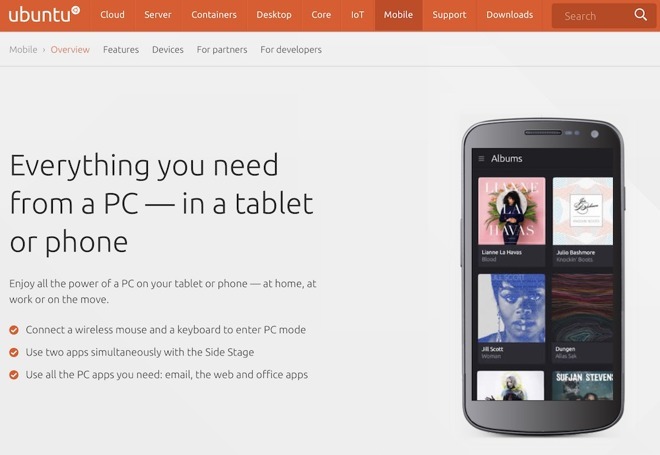 In 2015, Canonical's years-old convergence concept of turning a smartphone into a Linux PC--apparently inspired by Motorols'a ill-fated Atrix--was appropriated by Microsoft as "Continuum," an innovation of Windows 10 Phones that enabled them to act like a Windows PC, albeit like Ubuntu, they couldn't run actually run Windows software. Like Atrix and Ubuntu Touch, it didn't work out. A year later, Microsoft partnered with Canonical to integrate a Linux subsystem into Windows 10 and to collaborate on cloud services. Another year later, Samsung released its own innovation: DeX, a dock that turns its Galaxy S8 into a PC of sorts.